More than three-quarters of Internet users over the age of 15 use at least one social media site, and the more social media sites and apps there are, the more your customers will be expecting to be able to find and engage with you online. If they can’t find your business on Facebook, Twitter or any of the other social media platforms out there today, there’s a good chance they’ll find your competitors somewhere — and that’s bad for your business. When you imagine beautiful gardens, a certain lifestyle is evoked. Decide early on how you want your brand represented. Are you a formal garden, with landscaped terraces and chandeliers? Are you instead an eco-friendly business with farm-to-table dreams? Or, are you somewhere in between? Knowing which shoe you wear is essential to putting your best foot forward. First of all, gardens are a visual art. This lends itself immediately to Instagram and Pinterest. But don’t overlook your Facebook audience, which captures over 79 percent of adults online in the U.S., and signs up 500,000 a day; or Twitter, whose users are three times more likely to follow a brand than a Facebook user. And if a picture is worth a thousand words, then a video is invaluable as YouTube users spend an average of 40 minutes a day on its platform. Second, have clear plan of what your goals are and how you are going to accomplish them. Don’t sign up for social media accounts just for the sake of signing up. You need to have measurable goals in mind in order to gauge the success of your social media campaigns. 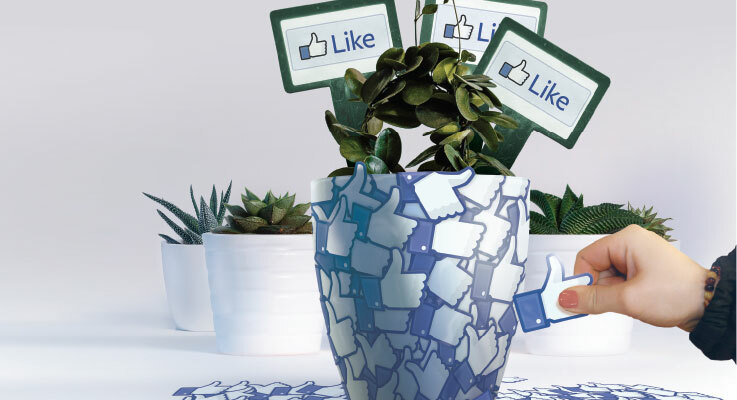 Collecting “likes” is not always an effective measure of success. Engagement can be hard to quantify, but it’s an important part of social media. Decide which associates you give access to the account. The people posting on these sites should only be those who actually want to; if you force social media on someone, it will show. Social media allows you to not only gain followers but to reach friends of those followers — and their friends. If you are overwhelmed with strategizing your content, consider hiring a professional to get you on the right pathway. Connect your social media accounts and align your logo and messaging. The cover photo is the most important piece of your social media pages — it’s large, it’s at the top and it’s what most people will see first. Use this as a way to capture a great first impression. Humanize your garden center with high-quality photos with faces and plants. Change it up periodically, or perhaps seasonally. Your icon should be static and represent your brand across all channels. Make an effort to truly connect with your followers as people. Automated responses won’t resonate. Ask questions like “What is your favorite plant to see in spring?” and let the conversations take off from there. Be sure to respond to every person who answers in a genuine, friendly way. Let the consumer know you care about their experience with your garden center. If a customer has a positive experience, feel free to follow up and highlight their experience. Likewise, if a customer has a negative experience, be transparent and professional about handling any missteps on your part. Consumers learn as much from your willingness to “make it right” as anything. Garden centers have a wealth of information to share, and so many content possibilities. Find ways to show off your inventory off while providing great tips and advice. Be seasonal, and remember that this spring’s gardening tips can be used again next year. This is often referred to as “evergreen” content — seasonal, but ageless. Be the expert voice in your field, and you will find that customers will seek you out. If you don’t have time to create content, repost other relevant content (i.e., general plants stories, trends, etc.). However, if you borrow someone’s content, be sure to provide attribution. Make sure you don’t overload consumers with a flood of content followed by nothing. It’s better to send out information on a consistent basis. You can hire a social media expert to create a monthly calendar of posts, or you can do it yourself by strategizing by season. Hold contests that require fans to post photos of their garden and get their friends to vote for them by “liking.” This way, users are asking their connections (those out of your network) to go to your page to like their photos, thus getting your brand on to people’s screens who otherwise wouldn’t engage with you. It’s most important to follow the rules to a tee on the main platform that your contest lives on and know what the regulations are on the sister sites you use to promote the contest. Be sure feature icons on your website with links for each of your accounts (Facebook, Twitter, etc.). Consider creating a point of sale sign that includes a quick response link — known as a QR code, which can be created for free at http://goqr.me/ — with a link to check in on Facebook, or sign up for your social media accounts. Be sure to include icons and links on your signature lines and newsletters. Monitor yourself frequently to see where and how you can improve. Use all available analytics to see which links are being clicked on the most or which content correlated in a spike or drop of visitors, followers, and likes. Keep track of your most successful posts, and feel free to recycle them down the line, but allow at least 60 days between the post and the repost. You should use social channels to generate brand awareness and to provide a channel of communication for you and your audience. You can do this by posting relevant content, asking for opinions, and truly listening to and engaging with your audience. From there, you can develop an online community of people whom you can turn into your clients. Ron McCabe is the president of Everbearing Services, a digital agency focused on the horticultural industry. The company specializes in websites, search engine optimization, paid advertising, social media management, newsletters, e-commerce and more. He can be reached at rmccabe@everbearingservices.com.